Our photo editor realized the significance of this historic moment, and published the picture, but in his haste he did not read the "fine print" that accompanied the picture, forbidding any changes. We should not have published the altered picture, and we have conveyed our regrets and apologies to the White House and to the State Department. The allegations that religious Jews denigrate women or do not respect women in public office, is a malicious slander and libel. The current Secretary of State, the Honorable Hillary R. Clinton, was a Senator representing New York State with great distinction 8 years. She won overwhelming majorities in the Orthodox Jewish communities in her initial campaign in '00, and when she was re-elected in '06, because the religious community appreciated her unique capabilities and compassion to all communities. The Jewish religion does not allow for discrimination based on gender, race, etc. We respect all government officials. We even have special prayers for the welfare of our Government and the government leaders, and there is no mention of gender in such prayers. In accord with our religious beliefs, we do not publish photos of women, which in no way relegates them to a lower status. Publishing a newspaper is a big responsibility, and our policies are guided by a Rabbinical Board. Because of laws of modesty, we are not allowed to publish pictures of women, and we regret if this gives an impression of disparaging to women, which is certainly never our intention. We apologize if this was seen as offensive. It's not only this paper that is consistent on this front; in Israel, ultra-Orthodox papers don't publish photos of Kadima party leader Tzipi Livi, nor use her first name. 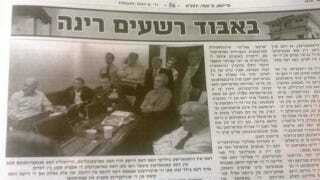 In one newspaper photo, the two out of 30 cabinet ministers that happened to be female were replaced with a black hole.